We design and manufacture the largest range of drum-handling equipment in the world. Whatever your handling needs, we’ll provide the best solutions. 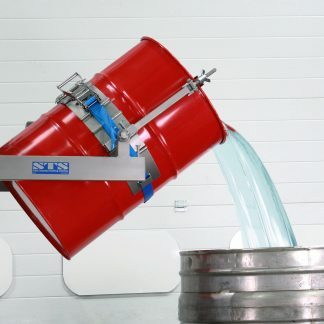 At STS we fully understand that both drum handling safety and operational efficiency is important. We design, develop and engineer quality drum handling equipment to help you protect employees and meet your company's long-term objectives. Years of drum handling experience passed on to you through our products. Enhancing company health and safety and drum handling efficiency. 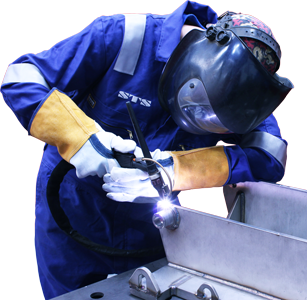 Our products reduce workplace injuries; helping people is what we do. Decanting heavy drums safely requires the right piece of equipment. Our drum rotators and drum cradles offer fully-compliant methods of pouring drum contents into industrial processes. If you need to weigh your drums while decanting from them, we offer load-cell versions of all our drum tippers; additionally choose from a wide range of fully-powered features. Our aim is to offer the widest range of drum lifting and tipping equipment available on the market, to assist in your drum handling needs. 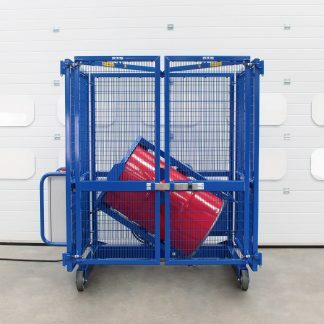 Raise drums from the floor or from pallets with minimum risk using our drum lifters, one of our drum rotators or our Universal Drum Trolley. We are experts in drum lifting equipment and as such are able to provide any advice needed. Whether your process involves loading containment bunds, dispensing machines or pallets we offer a large range of drum lifters and movers. Explore our products to learn how we can assist in your drum handling needs. In warehouses, stores and factories, you need to move drums safely from process to process. Our Universal Drum Trolley, drum lifters and drum rotators help you do just that, and each product has its own unique features. 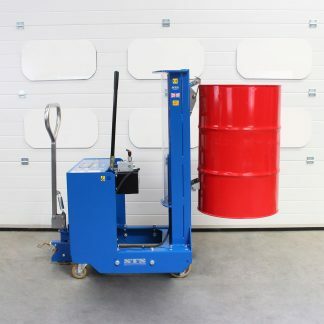 Traditional drum movers can be difficult to use; our quality and often uniquely-designed drum movers are safe, efficient and easy to operate. We offer the widest range of drum handling equipment on the market and have pioneered a range of pneumatic-hydraulic drum handlers for use in ATEX areas. Drum tumbling is necessary when contents that separate in storage must be mixed thoroughly prior to use. We supply our regulation-compliant End-over-End Drum Mixer in electric and pneumatic models to meet your requirements. 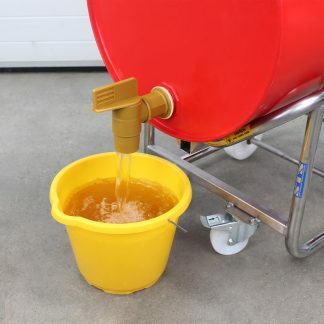 Drum tumblers form a critical process in many companies and therefore equipment must be robust and long-lasting; our mixers have proven to last thousands of hours of mixing in harsh environments.The drum mixers we offer cater for all drum sizes from 50 to 220 litres and are fully-guarded to comply with applicable regulations. Drum dispensing involves moving a drum from a vertical to a horizontal position. Using a combination of our Universal Drum Trolley and our drum cradles, you can easily move drums into the correct orientation. Manufactured in stainless steel, our drum cradles are designed to last decades and not just a few years. We've perfected the geometry used in our drum cradle designs to make the use of the cradles as easy as possible. Moving cylinders involves a high level of risk if the correct equipment is not used. Negotiate small steps and slopes using our stainless-steel Gas Cylinder Trolley; we can also offer this model with an overhead hoist. 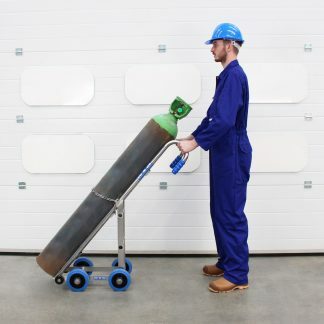 Moving high pressure gas bottles without handling equipment can be very dangerous; consider getting in touch to find our more about our cylinder handling equipment and how we can assist in your manual handling needs. The quality of the equipment is exceptional. Since implementing this equipment the risks associated with our site’s manual handling tasks have been greatly reduced and processes have become more efficient. The product has been a massive success with the employees, and the fact that you allowed us to try before buying was a hit. All in all working with you and your team has been a very good experience. STS is always the first place I look if I need handling equipment! It is a refreshing experience to work with a business that is interested in developing its product in line with the customer’s requirements. Be assured, we will always recommend your services to people within our organisation and outside our organisation when the opportunity arises. STS’s equipment is of exceptional quality and at the forefront of handling innovation – so much so that many other pieces of handling equipment lay abandoned, with operators preferring to use the STS equipment! We are completely satisfied with the product. 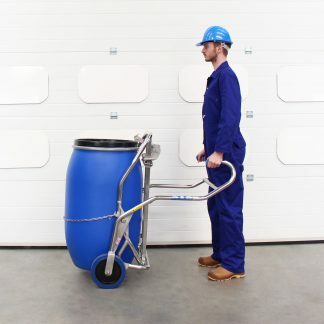 It completely removes our manual handling risk from manoeuvring drums and is suitable in our restricted space. All of our drum-handling equipment is designed and manufactured in the United Kingdom. We’re proud to support local people, suppliers and customers.